Find out how IntelliSents can help you! The key email-analytics add-on for your digital marketing suite! IntelliSents was designed to help you easily understand how your email programs are performing. 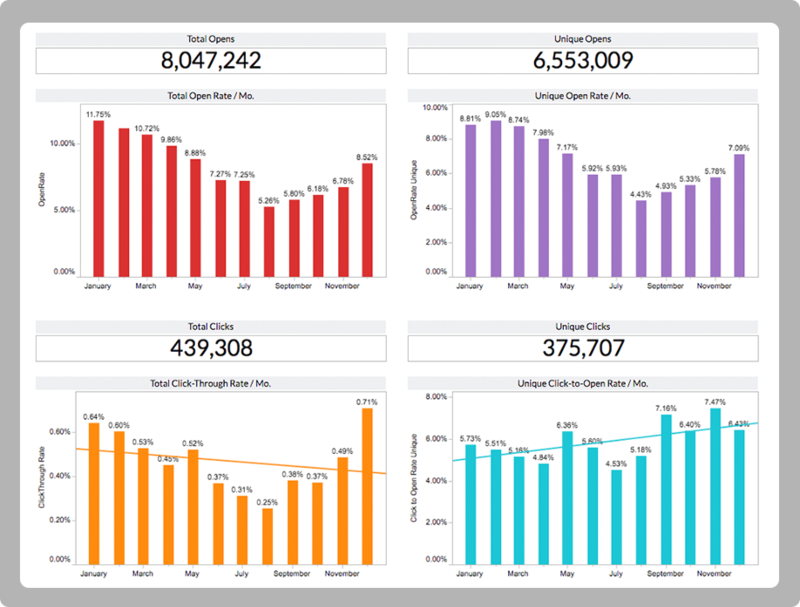 With all of your data presented in easy-to-understand dashboards, there will be no more drowning in numbers, and no more hours spent generating manual reports. With IntelliSents, your data is presented visually in real-time, so you can make real-time, data-driven decisions that increase ROI. Quickly identify critical deliverability problems at the ISP level (e.g., Gmail, AOL, etc. )—and know the moment they hit. 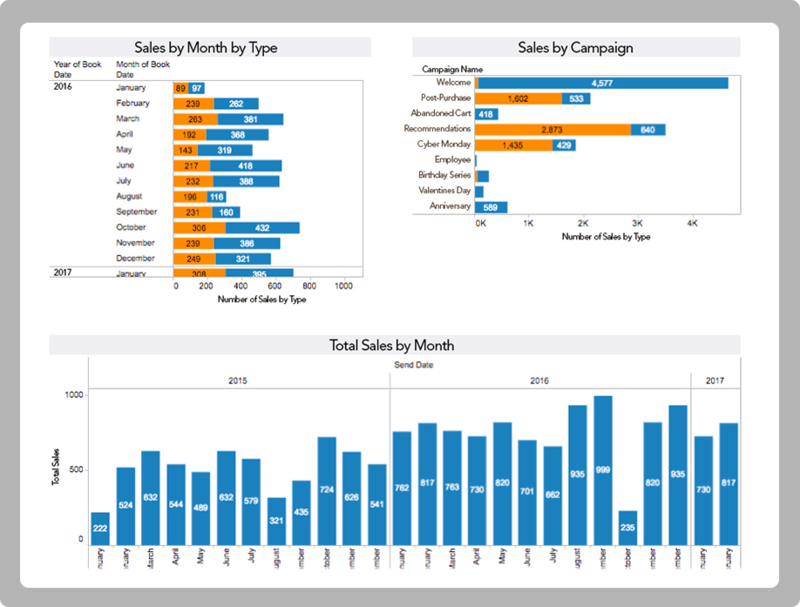 Track and visualize trends over 25 email-focused data points with this add-on to your email-marketing software. 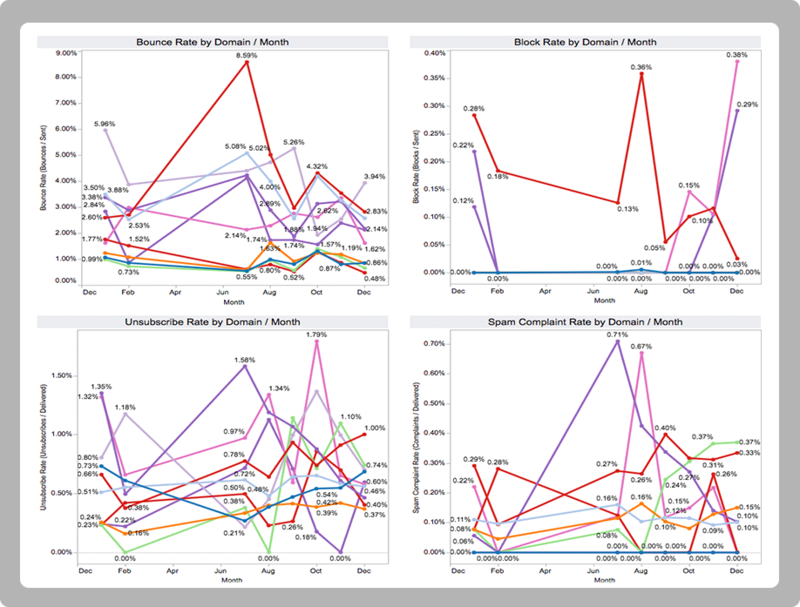 Plus, you’ll have easy access to drill down into the underlying campaign data. Daily updates means you are always current. Your data-driven marketing will never again be based on out-of-date information because the reports aren’t ready yet. IntelliSents currently integrates with these email service providers. But, we're always adding new ones. So, ask us if you don't see yours. valuable insights into your email campaigns. 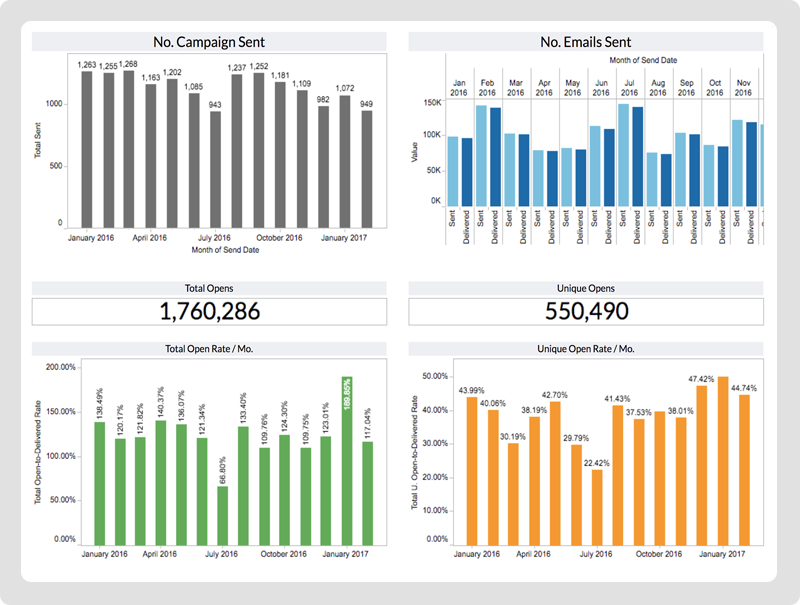 Get a bird’s eye view of your campaign metrics, or drill down to specific campaigns or segments for a visual representation of your email performance data. All essential email metrics are at your fingertips in our email dashboards. We can even customize the filters to tailor the email performance monitoring just for you. One of the hardest parts of email-marketing is getting through the ISPs (e.g., Gmail, AOL, etc. ), past the spam filters and into the inbox. And, as you know, deliverability can change on a dime. One minute it’s great and suddenly you have a problem. With the timely information you get from the Inbox Deliverability Dashboard, you get early notification of any email deliverability issues so you can immediately address the situation and keep your email marketing campaigns on track. High bounce rates can bring down your email campaign results and email deliverability faster than you can say trampoline. 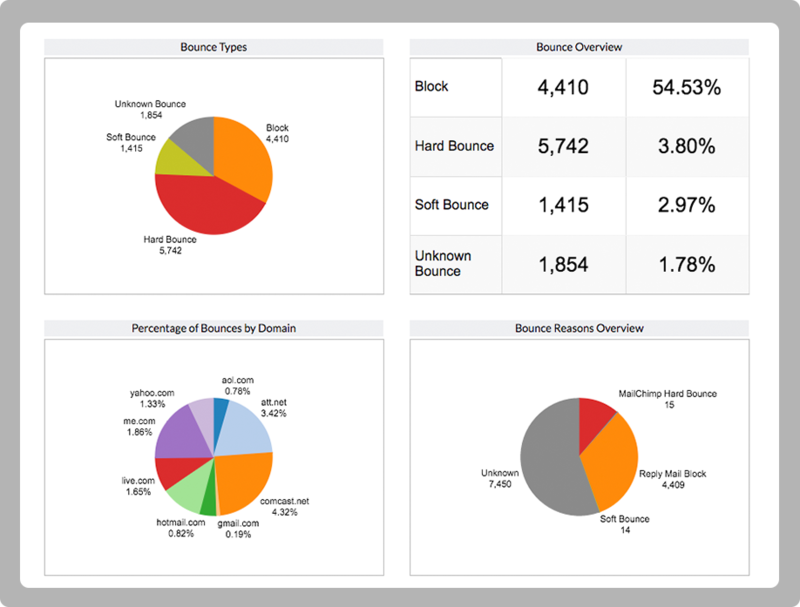 With the IntelliSents Bounce Dashboard you can identify specific bounces reasons and rates overtime before they ripple down and negatively impact your email reputation. The real measure of an email marketing campaign’s success is conversions. Now you can tie email analytics directly to your specific conversion goals with IntelliSents’s custom Conversions Dashboard. Measuring your email marketing’s ROI has never been this easy. Whether you want to drive onsite behavior or create a new customer through your emails, our custom dashboard will work with your Google Analytics data or internal conversions database to overlay conversion metrics with your email analytics. Meet with our product team and we’ll walk through the process for creating your custom conversion dashboards. Learn how IntelliSents can help your email campaigns soar!